Realism is a school of thought in international relations theory, theoretically formalising the Realpolitik statesmanship of early modern Europe. Although a highly diverse body of thought, it can be thought of as unified by the belief that world politics ultimately is always and necessarily a field of conflict among actors pursuing power. Crudely, realists are of three kinds in what they take the source of ineliminable conflict to be. Classical realists believe that it follows from human nature, neorealists focus upon the structure of the anarchic state system, and neoclassical realists believe that it is a result of a combination of the two and certain domestic variables. Realists also disagree about what kind of action states ought to take to navigate world politics and neorealists are divided between defensive realism and offensive realism. Realists have also claimed that a realist tradition of thought is evident within the history of political thought all the way back to antiquity to Thucydides. That all states desire power so that they can ensure their own self-preservation. Realism is often associated with Realpolitik as both are based on the management of the pursuit, possession, and application of power. Realpolitik, however, is an older prescriptive guideline limited to policy-making (like foreign policy), while realism is a particular paradigm, or wider theoretical and methodological framework, aimed at describing, explaining and, eventually, predicting events in the international relations domain. The theories of Realism are contrasted by the cooperative ideals of liberalism. Realism is one of the dominant strains of thought in modern foreign policy. As an academic pursuit, realism is not tied to ideology; it does not favor any particular moral philosophy, nor does it consider ideology to be a major factor in the behavior of nations. 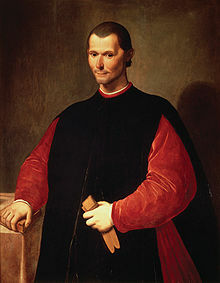 Priorities of realists have been described as "Machiavellian", with the primary focus being increasing the relative power of one's own nation over others. In summary, realists think that mankind is not inherently benevolent but rather self-centered and competitive. This perspective, which is shared by theorists such as Thomas Hobbes, views human nature as egocentric (not necessarily selfish) and conflictual unless there exist conditions under which humans may coexist. It is also disposed of the notion that an individual's intuitive nature is made up of anarchy. In regards to self-interest, these individuals are self-reliant and are motivated in seeking more power. They are also believed to be fearful. This view contrasts with the approach of liberalism to international relations. The state emphasises an interest in accumulating power to ensure security in an anarchic world. Power is a concept primarily thought of in terms of material resources necessary to induce harm or coerce other states (to fight and win wars). The use of power places an emphasis on coercive tactics being acceptable to either accomplish something in the national interest or avoid something inimical to the national interest. The state is the most important actor under realism. It is unitary and autonomous because it speaks and acts with one voice. The power of the state is understood in terms of its military capabilities. A key concept under realism is the international distribution of power referred to as system polarity. Polarity refers to the number of blocs of states that exert power in an international system. A multipolar system is composed of three or more blocs, a bipolar system is composed of two blocs, and a unipolar system is dominated by a single power or hegemon. Under unipolarity realism predicts that states will band together to oppose the hegemon and restore a balance of power. Although all states seek hegemony under realism as the only way to ensure their own security, other states in the system are incentivised to prevent the emergence of a hegemon through balancing. States employ the rational model of decision making by obtaining and acting upon complete and accurate information. The state is sovereign and guided by a national interest defined in terms of power. Since the only constraint of the international system is anarchy, there is no international authority and states are left to their own devices to ensure their own security. Realists believe that sovereign states are the principal actors in the international system. International institutions, non-governmental organizations, multinational corporations, individuals and other sub-state or trans-state actors are viewed as having little independent influence. States are inherently aggressive (offensive realism) and obsessed with security (defensive realism), and that territorial expansion is only constrained by opposing powers. This aggressive build-up, however, leads to a security dilemma whereby increasing one's security may bring along even greater instability as an opposing power builds up its own arms in response (an arms race). Thus, security becomes a zero-sum game where only relative gains can be made. The genealogy of realism as international relations, although acknowledging antecedents, gets down to serious business with Machiavelli, moving on to theorists of sovereignty and apologists for raison d'état, and culminating, in its early modern forms, with Hobbes's Leviathan (1651) before continuing the trek into the present. Neorealism derives from classical realism except that instead of human nature, its focus is predominantly on the anarchic structure of the international system. States are primary actors because there is no political monopoly on force existing above any sovereign. While states remain the principal actors, greater attention is given to the forces above and below the states through levels of analysis or structure-agency debate. The international system is seen as a structure acting on the state with individuals below the level of the state acting as agency on the state as a whole. This page was last edited on 7 February 2019, at 14:57 (UTC).